The American cranberry (Vaccinium macrocarpon) is one of only three North American native fruits that are commercially grown in the United States. 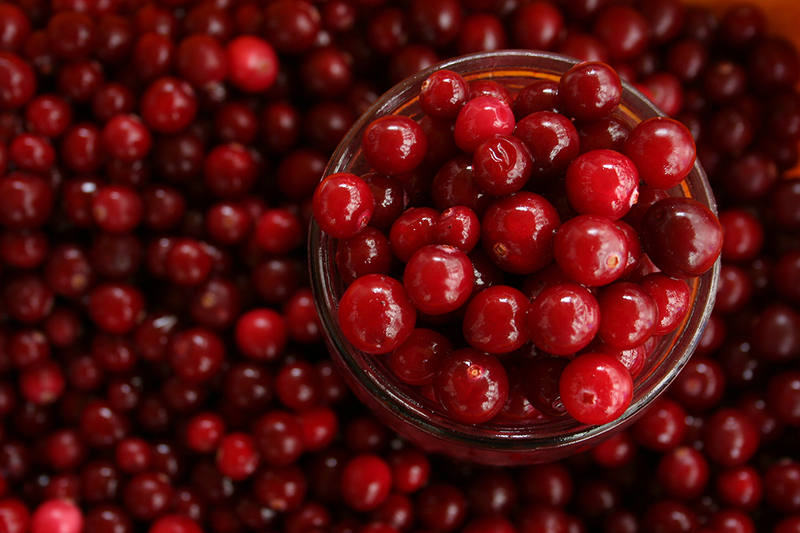 Folklore has it that Pilgrims served cranberries at the first Thanksgiving in Plymouth, along with wild turkey and succotash. During World War II, American troops required about one million pounds of dehydrated cranberries a year. Cranberries have been known by many different names. Eastern Indians called them “sassamanesh” while the Cape Cod Pequots and the South Jersey Leni-Lenape tribes named them “ibimi,” or bitter berry. The Algonquins of Wisconsin called the fruit “atoqua.” But it wasn’t until German and Dutch settlers came up with the term “crane berry,” because the cranberry blossom resembles the head and bill of a crane, that we arrive at what we know today as the cranberry. Nutritional Value. Cranberries are considered a healthy fruit. They contain no cholesterol and virtually no fat and are low in sodium. Various cranberry products may contain substantial levels of dietary fiber and certain vitamins, as well as a variety of photochemicals that may be beneficial to health. Cranberries are a good source of iron and have the highest levels of antioxidants among common fruits. Storage. Store fresh cranberries for at least two months in a tightly-sealed plastic bag in the refrigerator. Cooked cranberries can last up to a month in a covered container in the refrigerator. Fresh whole cranberries can be washed, dried, and frozen in airtight bags up to one year at 0 degrees Fahrenheit. To freeze cranberries, check berries and discard any soft ones. Drain them well after washing and put in a moisture- and vapor-proof bag or container and freeze. This is one fruit that needs no processing before freezer storage. Use them from the freezer as you would fresh cranberries. Preparation. Cranberries are a versatile fruit. They can be used as an appetizer, beverage, with a main dish or in breads, and desserts. The tangy flavor may need a sweetener to make them acceptable to most. To avoid sugar, try mixing cranberries with other fruits that have natural sweetness, such as apples, oranges or apricots. Grinding or processing together one pound of fresh cranberries and one unpeeled orange and mixing in one cup sugar makes a traditional orange-berry relish. This tasty relish will keep in the refrigerator for up to two weeks. Cranberry sauce is easy to make and will be a hit any time of year. Cranberries are a favorite at Sunday dinners, and family gatherings including Thanksgiving and Christmas Try making and serving your own rather than looking for the canned version. The standard proportion for sweet cranberry sauce is two cups fresh cranberries to one cup sugar to 1/2 cup water. After the cranberries have been sorted and washed, put the ingredients in a saucepan and boil gently for 10 minutes or until the skins pop. Remove from heat, skim and serve hot, or allow to cool first. The sauce can be served gelled. After cooking, pour into a serving dish and set to cool. Another version features 1 cup of raisins soaked in cold water in place of 1/2 cup sugar. Uses. Traditionally, cranberries were eaten only with holiday meals. Nowadays, cranberries are consumed year round as products come in many forms—fresh, frozen, dried, sauce, juice, and juice blends. Fresh or frozen cranberries can complement almost any recipe. Dried cranberries can be used as a tasty addition to trail mix, desserts, sauces, salsa, and salads or sprinkled over cold or cooked cereals. Dried cranberries also add healthy and tasty additions to quick breads, baked goods, salads, main dishes, and desserts. Dried cranberries also make a satisfying and healthy snack. Cranberry juice can be enjoyed like any other juice beverage, or it can be mixed into an exciting array of juice recipes. Cranberry sauce is available in two forms, jellied and whole. Cranberry sauce can often be used in recipes when fresh cranberries are not available. Cranberry sauce offers a sweet, fruity complement to a variety of main courses and is often used in salad dressing recipes and desserts. Health Benefits. Historically, cranberries were used by American Indians as a food, fabric dye, and medicine for a variety of illnesses, including bladder infections. Today, cranberries continue to offer several important health benefits. Besides helping to maintain urinary tract health, recent research has also indicated cranberries to be an excellent source of antioxidants that protect against cancer, heart disease, gum disease, stomach ulcers, and other diseases.